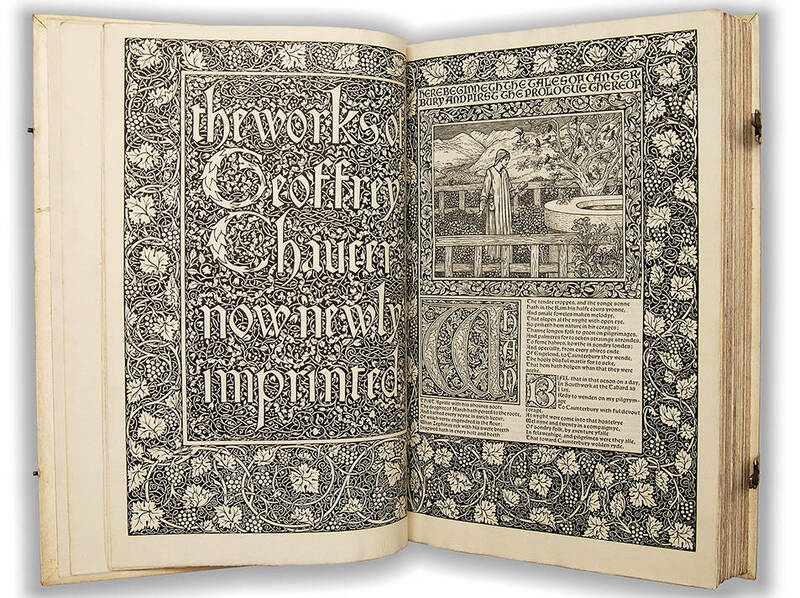 A work described as 'perfect...both in design and in the quality of the printing...the last and the most magnificent, the Kelmscott Chaucer' (Printing and the Mind of Man, p.223). 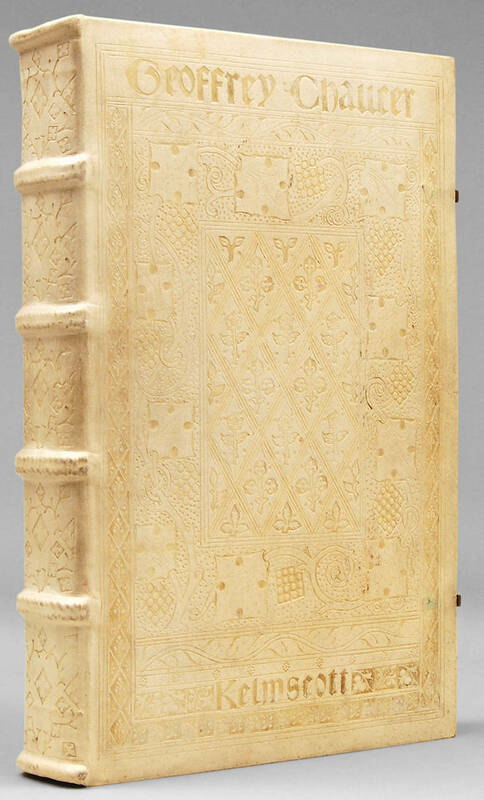 The most ambitious and magnificent book of the Press, the Kelmscott Chaucer was four years in the making. 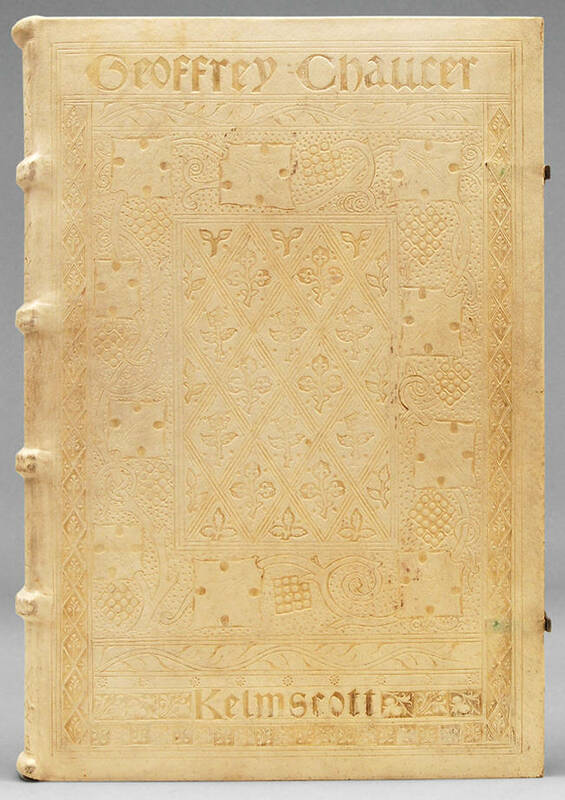 Morris designed the watermark for the paper, which was copied from an Italian incunable in Morris's collection and made entirely of linen by Batchelor. It took several requests before Clarendon Press granted permission to use Skeat's new edition of Chaucer. Edward Burne-Jones called the book 'a pocket cathedral - it is so full of design,' and 'the finest book ever printed; if W. M. had done nothing else it would be enough.' Burne-Jones devoted all his Sundays for almost three years to the work, and Morris came to talk with him as he drew. As the artist worked he increased the number of proposed illustrations from 48 to 60 to 72 to 87, and Morris accepted each change. The process of adapting the drawings to the woodblock, and engraving them, was entrusted to W. H. Hooper and R. Catterson-Smith, with Burne-Jones closely supervising every detail. Photographs and text by Peter Harrington, Rare Books, which retains copyright. Formatting by George P. Landow. Readers may wish to visit the firm's website, www.peterharrington.co.uk. The Works of Geoffrey Chaucer now newly imprinted. . Hammersmith: The Kelmscott Press, 1896.